Photo: 60 volunteers were enlisted as marine researchers at Vero Beach's Round Island Park. Scientists from Florida Atlantic University's Harbor Branch Oceanographic Institute launched the storied research institute’s first-ever citizen-science program last month – enlisting 60 volunteers as marine researchers at Vero Beach's Round Island Park. Participants set out in boats and walked on shore, catching and observing fish and collecting water samples to help Harbor Branch researchers get a better handle on what species live in the Indian River Lagoon. The turnout exceeded expectations and the citizen-scientists did not have to get wet or handle fish in order to gather data. That's because the new DNAngler program's cutting edge molecular technology identifies fish swimming through the lagoon without having to take them out of the water. Environmental DNA – from fish feces, scales or other tiny cells fish leave behind in the water – is extracted and analyzed for unique genetic 'barcodes' similar to tags on groceries that tell what species are present. Researchers compare that information with the citizen-scientists' fish observations to study species’ composition and diversity, and establish baselines of what is living in the lagoon – an important tool for resource managers, according to Dr. Gabrielle Barbarite, who runs Harbor Branch's outreach programs. "People haven't really categorized what's out there, so studies like this are important for building a database," Barbarite said. "It helps us understand what's out there and how it might change over time. The results have really good tie-ins to the health of the lagoon." 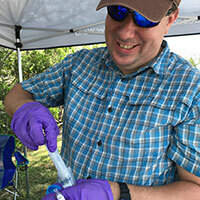 Barbarite said the inaugural one-day program was a "big hit,” with 35 water samples collected and numerous fish species observed and recorded. "It was a very useful thing to do, and the more we can involve the community, the better," Dickens said. Dickens and Barbarite want to keep the program going and are seeking grant money to hold more events and distribute water collection packets at the Harbor Branch visitor center and local bait and tackle shops with the aim of enlisting a permanent corps of locals who will collect samples, record fish data and keep an eye on conditions in the lagoon.